Actress who had a breakthrough role as Jessica Olsen in Disney Channel's StarStruck. 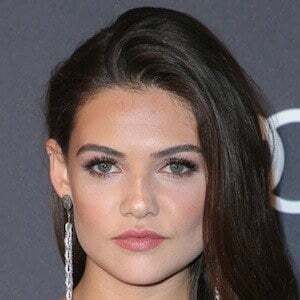 She also played Davina on the television show The Originals. She was first discovered in a hair salon in Chicago and debuted on television on FOX's Prison Break. She played Simone in the Disney movie Prom. Her parents are John and Georganne Campbell. She has a younger brother named Johnny. She has been dating actor Colin Woodell. In 2015, she was romantically linked to One Direction's Louis Tomlinson. She starred in the Disney Channel original movie StarStruck with Chelsea Staub.